I think Alicia is in the U.S., no? Miss Maggie is just beautiful. I have that pattern myself & now you have inspired me to get it out & make her up. I have this kit too - even the same fabric (I think!) I really need to get my kit out and make Maggie! How beautiful Rhonda! Lucky baby girl who is going to receive her. You have made her well. She is so cute. Someone will be very lucky to get her. Too beautiful for words. Your special little one will love it I'm sure and will be wrapped in the love that created it. How lovely she is, Rhonda. There is a lucky baby girl out there, who, I am sure, will enjoy the little rabbit for years! Oh MY! This is so adorable! 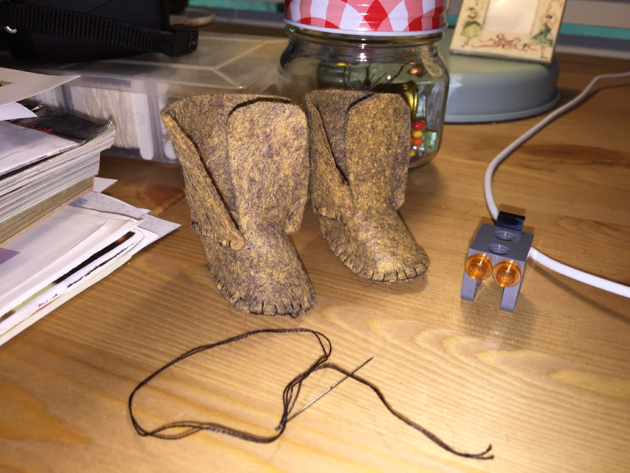 A wonderful keepsake made with loving hands. So beautiful and again a lucky future family heirloom. 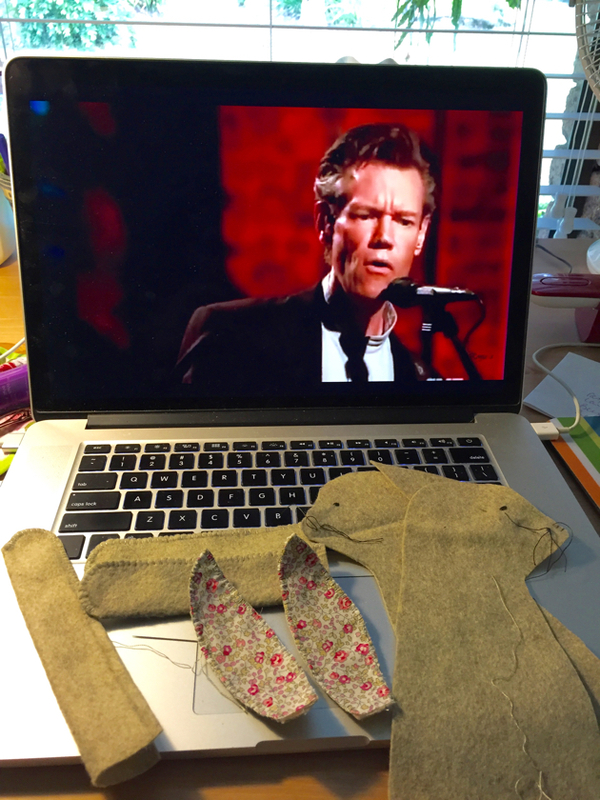 Love Randy Travis too - although he is not looking a well man lately. Well done Rhonda! She is lovely & I am sure your granddaughter will love her. Maybe a couple of little boys too!! She's just gorgeous. 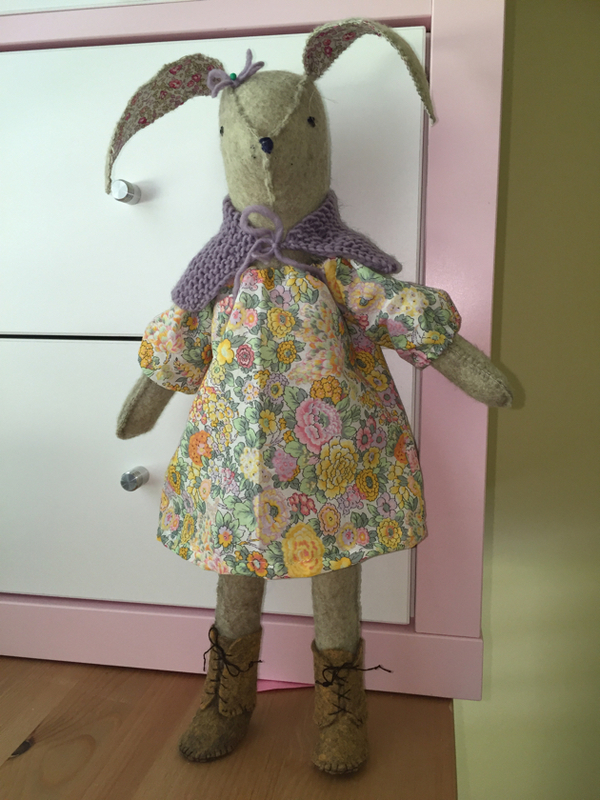 I've linked her to my Facebook page so that my grand-daughter who lives in Geneva and just loves rabbits can see her. That is so lovely! 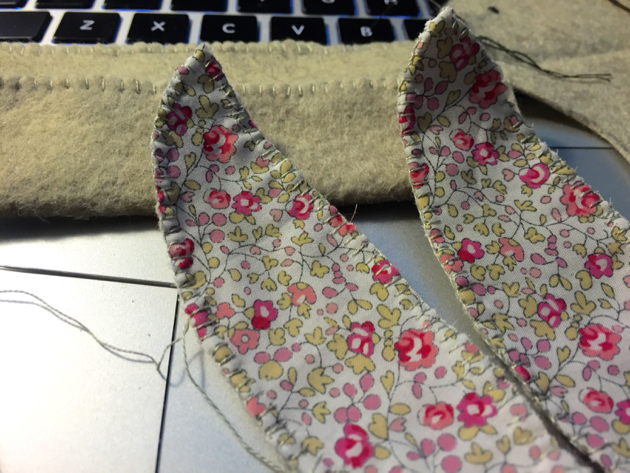 I love hand stitching things. I really should give something like this a go. That is so cute. I just love her. I am sure someone will love her for years to come. I still have the teddy bear my daddy brought me for my first Christmas. (I was born on Christmas Eve) So he is 63 almost 64. So cute! I love her cunning whiskers! 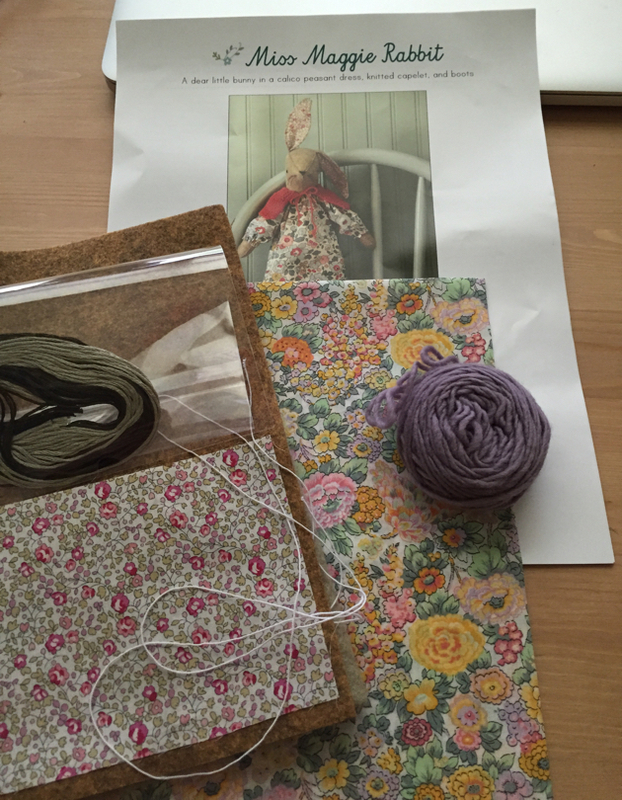 I have a kit for a doll that you have inspired me to pull out and put together for my coming granddaughter... if I can stop knitting long enough! Dear, dear bunnie! I'd love to see the finished smock! While you still have her, make a pattern to make another dress or two for her. In a couple of years that 'special little girl' will be wanting to changer her clothes. Miss Maggie is darling. She's beautiful, Rhonda. And I'm sure she'll be carted everywhere and loved to death - literally. Bringing to mind the conversation between Skin Horse & Rabbit (Velveteen Rabbit). Now that's love. 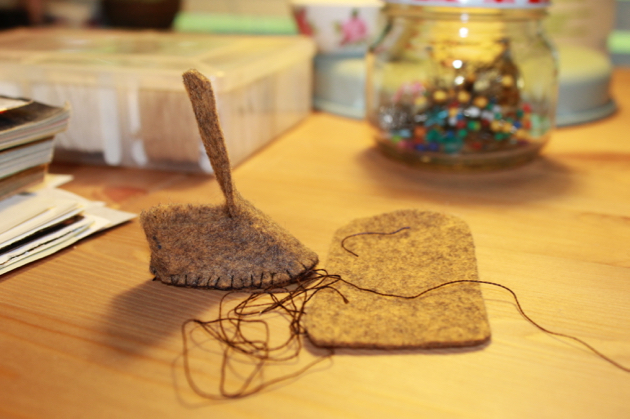 Have you heard of the 'magic loop' method of knitting small things on long circular needles? I found it on You Tube some time back and its been a fantastic trick to know as I prefer using circular needles when I can. Also thanks for reinstating the ability to post comments via 'anonymous'. Hi Maddie, thanks for letting me know about the magic loop. I'll have a look on you tube. Hi Cassy, thanks for this. I haven't heard of magic loop so I'll look into it. I love the rabbit. She is just beautiful. I also love your choice of music. My favorite Randy Travis song of all time is Forever and Ever Amen. Hello Gerry! I've been thinking of you and your beautiful country. I am still using your pin cushion. 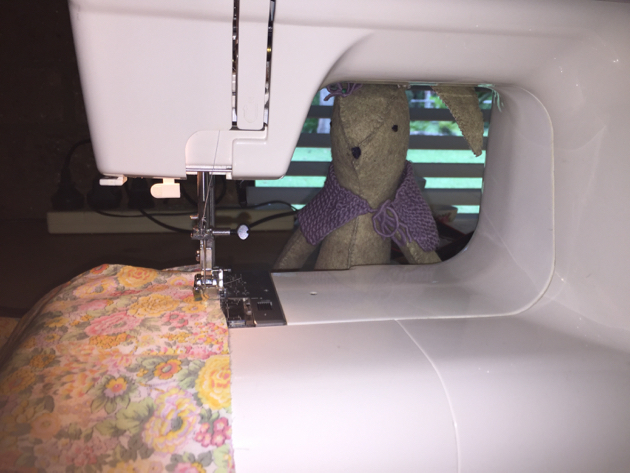 It is always close at hand when I sew. Rhonda, she is beautiful, and I love the extra touches you've made. Alicia has a wonderful style to her designs. Bless you! Hello from Paula in Chicago, 3rd largest city in U.S.! You're in comment section of recent Alicia Paulson blig, Posie Gets Cozy! She also sells her patterns as PDF via email. Now you simply must make Basil Fox for your grandsons! I've sewn him, he's adorable too! Enjoy your day! Beautiful, job well done. 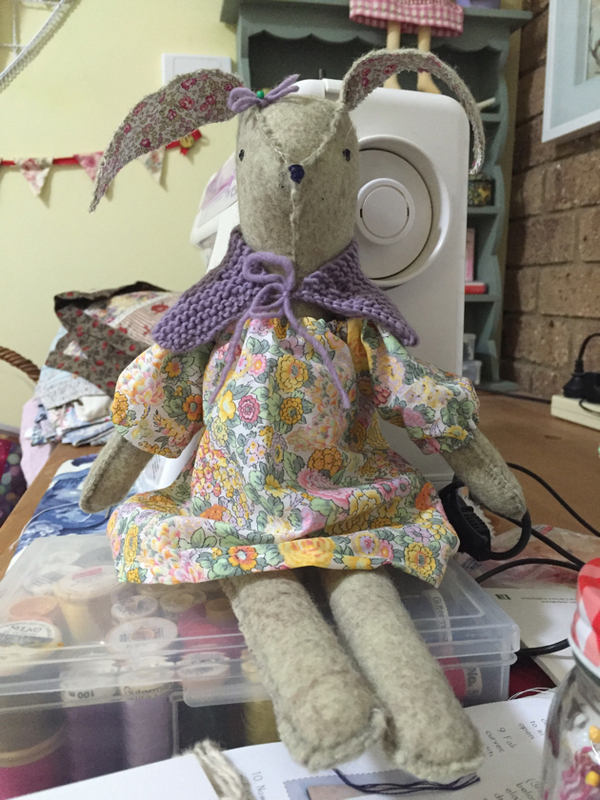 Hope your granddaughter loves Maggie Rabbit, such a lovely gift to treasure. Happy New Year Rhonda. 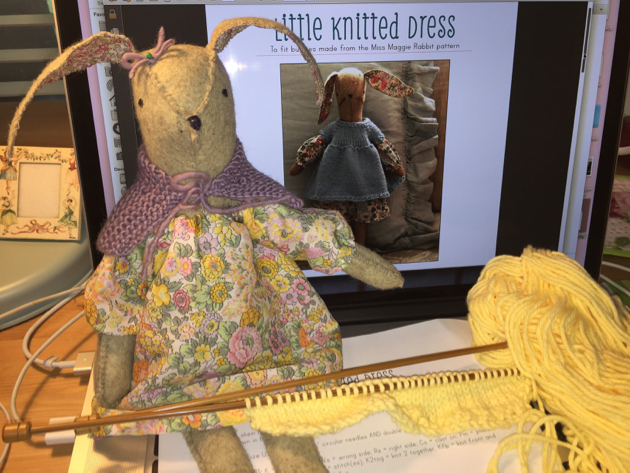 What a lovely rabbit, will check out Alicia's website to maybe get the pattern. Best wishes from Tassie .... on a hot and sunny day.